I created this illustration for the Minneapolis Star Tribune for a story about a therapist who walks and talks with her patients rather than meet with them in her office. 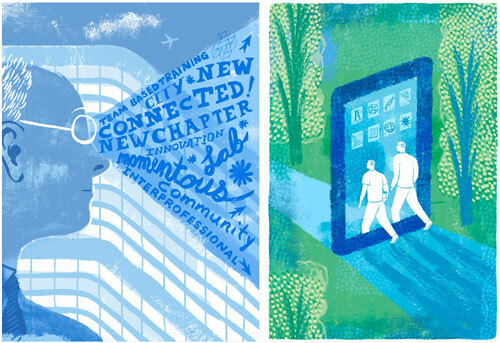 The art director saw these two illustrations in my portfolio and asked me to create a new illustration incorporating hand lettering with walking figures. To reference, Minneapolis, I chose the Stone Arch Bridge, a metaphor for the therapy. I tightened up the sketch but the art director wanted me to include land at the top of the illustration, a reference to the city, or a park, something on the other side of the bridge, a destination. I roughed up a quick revised sketch with a cityscape. These rougher figures actually influenced the direction of how I would end up depicting the figures, less line and more shape. Above is the hand lettering I created for the illustration along with some buildings and shrubs. I decided to go with a park destination rather than a city skyline destination for the top part of the illustration. Below is the Photoshop art in sequential states of completion. I begin with a background of textures and then repeat and edit these textures to create the other parts of the illustration. I really liked this stage, felt finished to me, calm yet active. Above is the final with the strip of land at the top. This strip added more color and gave the piece an optimistic feeling, like spring. One of the effective activities discussed involved patients tending to plants. I wanted to make a decorative portrait that showed this relationship between the patient and the plants, as well as the internal isolation of the patient’s mind. The larger portrait represents the external activity, the patient tending to the plants, and the smaller internal portrait represents the patient separated from reality. Below is the process, beginning with thumbnail sketches, rough sketches for the client, and the final sketch approved by the client. Above is the ink line work I made with a Pentel Brush Pen. For my work, I use new textures made from scanned elements as well as old textures pulled from previous illustrations. For this illustration, I used three textures pulled from previous illustrations and re-colored them, light orange for the main texture, medium orange for an additional texture, and green for a texture that will relate to the line work. The image below shows the inked line work on a layer above the textures. I brought in additional textures to create the head shape, and additional textures for the body. And below is the colorized line work followed by the final illustration.